What type of roofing is best for my dollar? Flat Roofing ? Sheet Metal ? 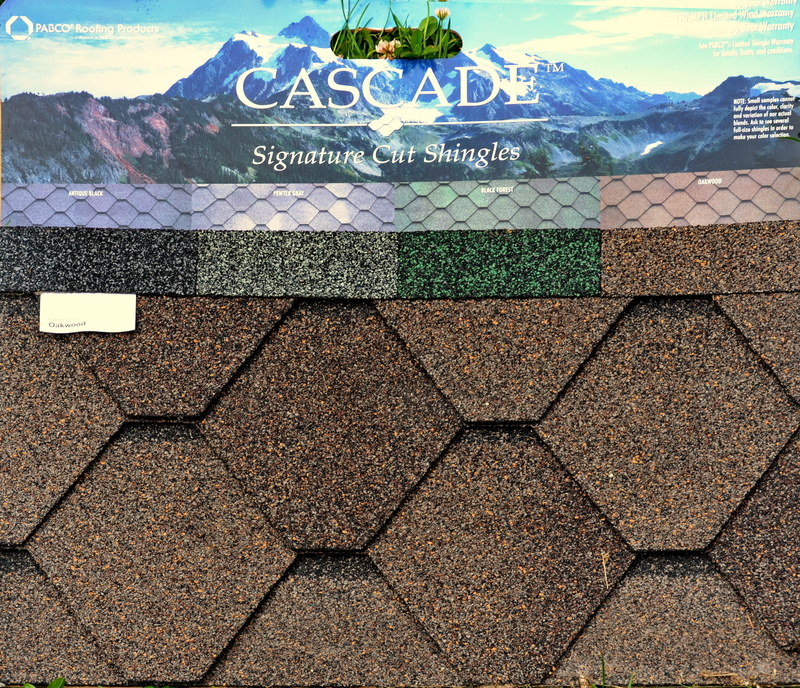 Asphalt Shingles ? Clay, Concrete, or Slate ? Wood Shakes ? Paint-On Patch Seal ? Stretched Rubber Membrane ? Thatch ? What kind of roofing issues am I likely to encounter? As you read this keep in mind I am not selling any roofing work, so there is not the bias here to promote one type of roofing cover over another. I am just hoping to help Homeowners from wasting their money on a bad investment in a flawed roofing cover and terribly poor workmanship. Sadly you are 99% likely to get ripped of without this dilligent effort to make sure they do their job right. As a hands-on Gutter Contractor since 1993 I have crawled up on thousands of roofs and have yet to see evidence of a decent Roofer. I have written here advice about roofing to help curb this awful trend. I know you would rather not have to research and study this issue about the details of roofing covers. You should be able to trust your Roofing Professional, but that simply is not the case. If you don't read it over and print out the check list at the bottom and use it religeously the jokes on you. You would do well to read over this web page of mine very carefully before signing a contract with a Roofer, or you are highly likely to get very shoddy work done with inferior parts, since there has not been any inspection process required of Roofers for several decades. It really is that bad! This is a huge problem Nationally. This is not just a local issue here in the Northwest. I have also found much if this problem is an intentional deception to rip off Homeowners, which in turn has also become a huge factor in the polution of hazardous waste, because of premature roof failure as resuts of this intetional fraud. I mean this in the most litteral sense. You will need to hire an independent advocate to make sure they do it right, since they are not required to file for an inspection permit for reroofing work, which is largely why this type of work has become such a huge problem, since they have no over-watch system implimented; like they do for plumbing and electrical work. There are some important concepts to consider regarding any roofing material and how it is installed. Although, try to keep in mind it is the roof flashing that is designed fail first, since there is no long term warranty on the flashing used. Any metal used on a roof that can attract a magnet is just cheap steel and will rust out well before the lowest life roofing warranty had expired. How does your roof measure up? Test your flashign with a magnet. There is over 90% chance it is just steel. Aesthetics of course is a subjective personal issue. A shinny bright colored metal roof may look nice on a business that is looking to garner your attention. Although, you may feel it looks tacky on most residential dwelling. Cedar shake roofs might be seen as a charming rustic look, but please. Let's call a spade a spade here. It is more like a straw hat on a woman wearing an evening gown set over most houses I've seen. Look around at many houses with your eyes wide open. Avoid fads. A material that will last several decades, if not half a century of exposure to the elements; Sun, rain, high winds, falling branches, decomposing debris, mildew, moss, fire, and workers tromping around up there as needed: roof and gutter cleaning, or repair. Any product is only as good as it's weakest link, so the steel flashing that is used on over 90% of roofs will not last even as long as a low life 25 year roof. Let alone a better 50 year roofing material, yet that has remained the standard for over half a century, since the development of aluminum sheet metal. 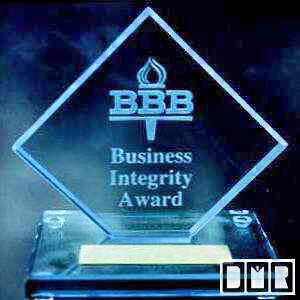 This is because of low ethical standards of all roofing manufacturers and most Roofers taking advantage of their Clients who do not know the difference. Improperly installed or rusty steel flashing is clearly the #1 issue of roof failure, which is a clear reason whole metal roofs are a TERRIBLE investment! Wood shake roofs are also terribly fragile and dangerous for workers to be up there to clean or repair your roof, as well as highly flammable. A decent rust free metal flashing to use on your roof will not attract a magnet at all, so it is important to test the flashing they will use before it goes up on your roof. If it does stick to a magnet you must stand your ground to insist they use different flashing, no matter what they say or delays this may cause. Think of the landfill issues this shoddy parts cause from all the premature reroofing that is done each year. I cannot stress enough how imperative this flashing issue is! Handling temperature changes from below zero to 160 degrees in the scorching Sun, while still sealing the rain out, even in the stormiest weather with overlapping joints and flashing, so there is no need for sealants of any kind to be used. That's where metal roofs and flat roofing materials fail the most. Those coverings are too long and will move, shift, or shrink over time, and compromise the integrity or seal of your roof. On most every roof I've been on I see exposed rusty nails within as little as 3 years after the new roofing was applied. If there has to be an exposed fastener it should be no less than a high grade stainless steel screw with a rubber sealed washer to hold constant pressure and maintain the seal. This type of screw will not attract a magnet, so test them before they are put on your roof. Just because they say it's stainless steel does not make it stainless steel, since magical thinking is a bad practice. Most Roofers would not even know where to buy stainless steel screws, so that should tell you something about how serious this issue is. Many homes with a vaulted ceiling are not well insulated, so when reroofing this would be a time to consider adding a Styrofoam layer on the roof to also make it quieter. Even if you do not have a finished attic space insulating the roof can help reduce the heat build up and condensation damage. Lots of houses have ventilation ducting up inside the attic space, so that can help reduce the loss of that energy in both cold and hot seasons. The old roofing should be stripped off. New plywood will need to be added over the Styrofoam to attach the new roofing onto. Also, for a nominal cost 2X2 boards can be added to provide an air gap above and or below the Styrofoam to allow even more insulation and reduce possible condensation issues. These 2X2s are a good way to gently fasten down the Styrofoam before the plywood gets put over them, so they do not get blown off the roof. Is the roofing material susceptible to igniting in case of a near by fire or our wood burning chimney? You may think a house fire is rarely cased from outside the structure, but this is an issue that is relevant more in some areas than others. This is the main reason clay roofs are a lot more common in Southern Cali. Wood shake roofs can be treated with a flame retardant, yet this is not the norm, so they are most at risk. Is the roofing material recyclable when it does need replace, or is it listed as hazardous waste, such as with asphalt roofing material? This is the one good thing to say about a metal roof over asphalt shingles, but if you read more below you will discover the numerous disadvantages that far outweigh this one posive atribute. Why is rust-free Flashing so hard to come by and costly when a thicker aluminum sheet metal is actually no more expensive than steel? One of the main factors of this issue being such a problem is because the Roofing Suppliers are under contract to ban the use of rust free flashing. This is only done to avoid warranty issues of the shingles they sell; because the manufacturers need the flashing to fail first. This way there is no liability on the manufacturer's part, given the flashing they sell has no long term warranty like the roofing material. Since most Homeowners do not think to ask about the warranty of the flashing used this has been their 'catch 22'. This way you as the Homeowner have no recourse for a premature roofing failure; regardless of the long life-span roofing you had paid extra for. Make no mistake; this is done quite intentionally; on purpose to your detriment as a Homeowner. And this contributes to much greater landfill issues of that hazardous waste from premature roof failures. Quite criminal in my way of thinking, yet this has been allowed to continue as a legal scam for over half a century, which costs us billions each year and unimmanginable harm to the environment. As a general rule an Inspector would not want to see flashing reused. In most situations the counter-flashing around your chimney is deemed too difficult to replace (or so they will say), so most Roofers will just leave it there as if it is expected to last another roofing cycle. Most all Roofers will not bother replacing counter-flashing around a chimney or even the step flashing around your dormers. Even if that was the only reason they were hired to reroof your house. Most flashing used is just painted steel, so even if it were not rusty at that point it is not going to last another 20 + years. 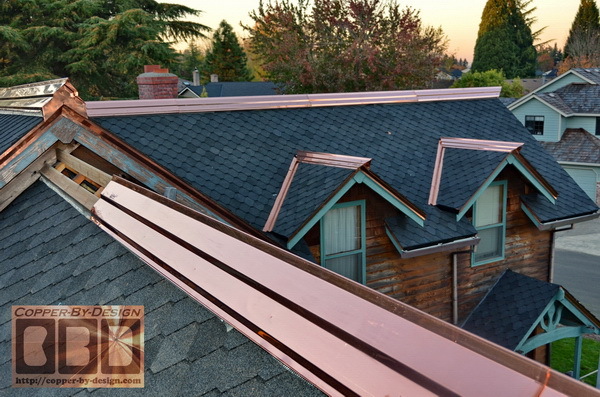 Aluminum flashing may last that long, but the paint will peal off making it look horrible, so that's why copper is best practice when the next Roofer will not likely be willing to replace these critical aspects of your roof. 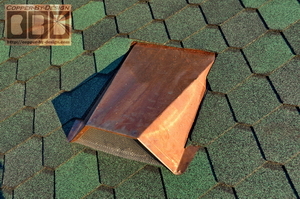 A standard thickness 16oz copper flashing can be reused 1 time without concern, since it is rated to last a good 60 years, but how can a Roofer tell for sure just how old that aged copper is? The 20oz copper I use is thicker, so it should last much longer: 80 to 100 years. I use it because it is sturdier and is more dent resistant. The thinner 16oz copper is flimsy and can get bent up just from normal handling, so I stopped using that thinner copper over a decade ago. Keep in mind how most of the cost of any construction work is not the material cost, so better materials should not actually cost that much more than using a cheap low-life product. Below are some examples of the roofing repair I've done in the past, along with good advice on how to avoid getting taken advantage of by an unethical Roofing Contractor, which seems to be most all of them across the Nation, so this is not just a local issue. I hate to sound so paranoid, but I've yet to see evidence of a decent Roofer over the last quarter Century with the 3,000+ roofs I've been on and seen close up. I've seen too many Homeowners get taken by these shysters. Their Salesmen will talk a good line, but that does not mean they will have their workers do what they had promised you, so you need to be diligent and stand firm to help change this worst avenue of construction work for the better. If we don't push this industry they will have no reason to change. Stand your ground! Here is what aged asphalt roof shingles looks like close up. 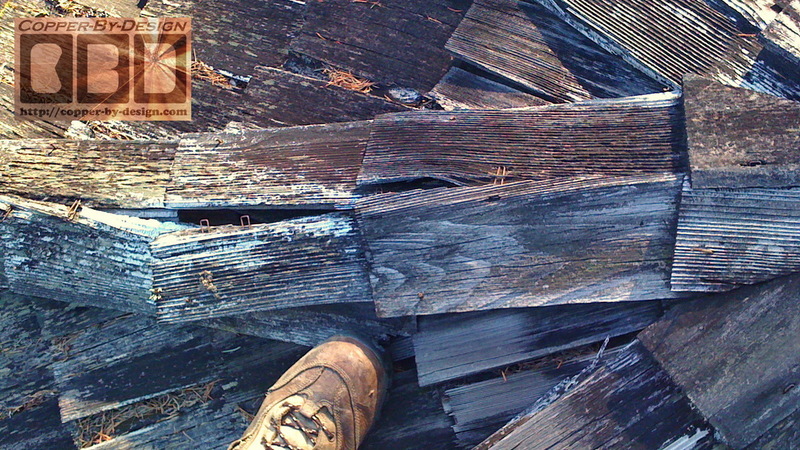 Click on the photo to get a better look at the dried up river-bed look of these shingles. If it is not this bad with broken off missing shingles then your leak is most likely caused from a flashing issue, and a full roof replacement will most likely not solve those leaks, which was still the case on this house, which is why there is tar smeared up against this chimney. The caulk seen at the base of this chimney shows what they had done to temporarily fix the leak, since it was not flashed properly. If flashed right there should be no need for any caulk sealer. Even this mastic used has begun to crack and failed. Sadly, there is still over a 90% likelihood the Roofer will not properly reflash your chimney when reroofing your house. When your Roofer is called back to fix the continuing leak he will say it is not his responsibility to reflash the chimney, even though this issue was not discussed at the time you signed a contract with them to reroof your house; how he has no intention to finish the work he was hired to do. He will claim it is the Brick Mason's job. That would be fine if he had bothered to call a Mason in to do it! Or at least told you how he believed it was your responsibility, in order to finish this reroofing work. It is a lie. He was under contract to be responsible to make sure the roof is finished properly with all new material, yet this unfinished workmanship is most likely what you will encounter with most Roofers. I have been up on several thousand residential and many commercial roofs, and in that process I've followed behind over 5 dozen Roofing Contractors here in the Portland, Oregon Metro area with my gutter installation work, where I've had the opportunity to see their work up close. I have yet to see evidence of a decent Roofer who uses a reasonable set of good ethics in their work. I wish that was an exaggeration. In stead I have thousands of horror stories and frequently warn my Clients about these issues, even though it has little to do with the work I'm doing. I have even interviened in cases where I knew the Roofer had promised to use stainless steel flashing on a tile roof job, yet had instead installed painted steel valleys. 'Since you are not ethinc enough to pretend you speak no English (like their Hispanic workers) you are never to speak to the Homeowner no matter what, as it may conflict with what our Salesman had told them'. If they ran a legitimate business this would not matter. I did carry Roofers insurance for a few years and had done a dozen or so full roofing replacements with the high standards listed on this web page. I'd of course work much slower than any of the other Roofing Contractor's team of workers, so I simply could not do the volume of work to afford the high cost of that type of liability insurance, which those other Contracors had caused to be so expensive, because of such shoddy workmanship. I'd spend a month to replace a roof and gutters on a medium size house doing it the way I felt was needed, where they would reroof the same house in a few days. The Roofers in this area have screwed up so badly w/o even getting past the 1 year minimum warranty required by the CCB to the point that this area of work has become a guarantee of poor workmanship in pretty much every case. I felt bad for my Clients; seeing them get taken advantage of every single time. The Oregon Contractors Construction Board (CCB) already has known full well what a huge problem this is (since well before I got my contractors license 1993), but for some strange reason they still have not done anything to resolve this issue. I say this because the CCB has reported around 80% of all claims they have to resolve are due to faulty roofing work showing up within the first year of completion. That is after the Homeowner had already exhausted their efforts to resolve those issue with that Contractor directly. Although, after the first year of completion your claim would be deemed as invalid and thrown out; no matter how valid your issue was. All Contractors know all they have to do is stall you long enough, so that 1 year deadline has expired, and they are 'Scott-free'. This detail has detromentally shaped construction work over the last half century. Because of shoddy workmanship of Roofers very few insurance companies will insure Roofers, and those few who art willing to insure Roofers have to charge over 5X more; compared to all the other types of construction work. Keep in mind how this has nothing to do with dangerous working conditions up on a steep roof. That's covered by Workman's Comp, which is also 2X more. After a while I could not avoid the reality of how it simply was not feasible for me to continue doing roofing work. I now do not carry the appropriate liability insurance to do roofing work, so I am not able to sell any roof jobs, which also makes this web page unbiased information for your benefit. If it were to come to the attention of my insurance carrier that I did any roofing related work now they would drop me, since they will not cover Roofing Contractors and that would put me out of business. It really is that bad. Hence why I cannot market this kind of work and will not do roofing projects any more, so don't bother asking. This web page is only to help educate Homeowners and hopefully a few Roofers about what is required for a decent roof cover. You also will need to see proof that your Roofing Contractor has a current liability innsurance policy that covers roofing work. You cannot just take their word for it. Way too many contractors are working illegally, because that insurance policy is too expensive, or their reputation is so bad no carrier will cover them for that type of roofing work. Although, there is a far more sinister problem at work here that we need to address: the predominate use of steel roof flashing. Any product is only as good as it's weakest link. If the flashing fails first the liability will not be against those companies who make roofing shingles. If they were to illegalize the use of steel flashing we could reduce this hazardous construction debris to our landfills by 1/3 or more just from premature reroofing work that we all suffer with. Just as with car manufacturing; the oil industry had sought to infiltrate the roofing industry to keep them from providing any rust free alternatives to steel flashing, so your flashing will not last even as long as low life 25 year roof. All just so they can sell more oil, which is deemed hazardous waste. This also absolves them of any liability to the warranty they have on that material, since the flashing failed well before the shingles had. Virtually no Homeowners think to ask about what flashing is being used or what it's warranty is, so they continue to get away with it decade after decade. This needs to change! A metal that will not rust also will not attract a magnet, so that is an easy test you can do to see if you are a victim of this very intentional scam. Liability insurance for Roofers has become nearly impossible to get these days, besides just being far too expensive: at 5X the cost of any other construction work. Many Contractors who sell roofing jobs do not have the right kind of liability insurance to have you covered in case they screw up so bad and are unwilling to fix the problems. Thius is because of that high cost and from having their policy canceled due to too many claims against them, so you are not actually covered if they mess up. This has nothing to do with the dangers of roofing work. That's covered by Workman's Comprehensive insurance, which is also 2X more than any other type of construction work. Their liability insurance is to protect the Homeowner from faulty workmanship or damage resulting from their roofing work, so this means the Homeowner is not protected in many cases, and these Contractors wind up with multiple claims in small Claims Court after the CCB had already suspended their license. Yet, they will continue to sell roof jobs to unsuspecting homeowners. To help fight this scourge in our society I have added information and photos here on this web site to help people learn how to avoid getting taken advantage of by most, if not all 'Roofing Contractors'. It lists what to demand, so you do not get abused like this. Sadly few Homeowners research this information before they are suffering a terrible loss from this type of work on their blessed home. Flat roofs are those with a 2/12 pitch or less. There are several types used, but tend to have a rather short life-span due to problems of that material not designed to expand and contract with temperature changes, and will split and rip apart from that expantion of the underlying structure. Wind damage is also a common problem. Hot tar, often covered by large rocks to shade the asphalt from UV exposure. Flat roofs are very impractical here in the NW. Especially where we get a great deal of rain fall and debris from near by taller trees than areas with less rainfall. Flat roofs are always a problem for several reasons and do not last long. You are lucky to get more than 10 years out of it without major service required. One problem is they must be installed perfectly to seal out the rain water, and that is not human nature. They often will have rain water puddle on the roof and collect debris in those puddles, which will turn into thick heavy mud with raging bacteria within and it becomes compost and germanate the seds embeded. Then the root structures can dig into your roof cover in search of moisture. The sole purpose of the sand on composite asphalt roofing shingles is just to shade the petroleum material below from the harmful UV rays of the Sun. Very few flat roofing materials are made with some sort of rock shade. Slick talking sales-people will try to sell you a PVC blanket to cover the roof with, but don't be fooled to believe it will not suffer the same fate from Sun exposure. Or worst yet; wind damage from the lack of adequate fasteners along all the edges. Moss is also a common problem for any type of roofing material, yet the common methods of removal can be even more damaging. The easiest and quickest solution for this is to wash it off with a pressure washer. Although, this often does more damage to the roof than the mosswould have if left alone. You will be hard-pressed to find a contractor to spend the time and effort to clean it off safely without poisious chemicals. Read over our Moss Treatment and Control web page for more details and better solutions. Cleaning those roofs with a pressure washer blasts off a large percentage of the sand or paint, and then the UV rays Sun will rip the roofing to shreds in the next few years. I have designed a flat roofing process that is better than any other metal roof concept I have seen, which better allow for expansion and contraction as the temperature changes. As well as much easier to replace a specific panel if it were to get damaged. Although, it is not geared to be installed by the average dim-witted Roofer. Most any successful roofing product has to be simple enough to be installed by the stupidest Roofers out there. You can contact me for more details about this concept for flat roofing,m as pictured here. 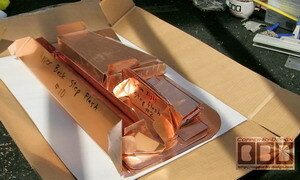 Yes, below is a solid copper roof before it had tarnished. I also provided a vented ridge cap system the next year on this same house. I recently added some new photos from early 2019 to show how it look after tarnishing for the last 7 years. They report not having seen any problem with this copper work I did for them. I am no fan of the petroleum industry, but I would have to say that composite roofing is the best value if installed correctly and they use a rust-free flashing that will last as long as the shingles, which is a huge problem these days. The down side is how this type of roofing is listed as hazardous waste and polluting our landfills by the thousands of tons each year just locally, but here are the advantages and my advice. (a) It seems to at least go it's promised life span as long a good rust free flashing is used. A simple magnet test can reveal what type of flashing they are about to use. Only steel will attract a magnet from it's iron content ('IRON' being a 4 letter word in this case. Same as the word 'RUST"). You must be there to inspect it before it goes on your roof, and insist they do not use any steel parts; including the nails that hold the shingles on. You cannot trust what their Sale Rep says. You may even have to order the aluminum flashing yourself from a local sheet metal shop for your Roofer to use, and make sure they actually use it, and not just take it in to a scap yard to get cash for it. They may substitute steel flashing, and scrap your aluminum for a profit. (b) It remains much safer to stand on decades later to access the roof for cleaning or other service that will be needed on the roof. (c) The cost is more reasonable than most of the other roofing products and somewhat time tested. 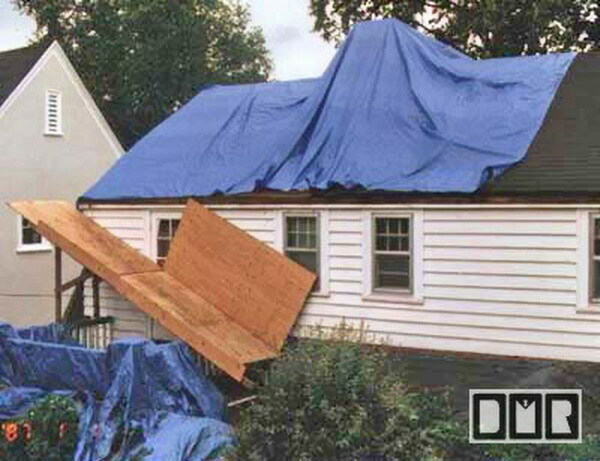 (d) Improper flashing is the most common failure of roofs. Why pay more for more expensive roofing when there is no difference in how it is flashed? It is better to pay more to insist on rust free sheet metal flashing and have it flashed properly than buying a more expensive roofing product. Otherwise you are just burning thousands of $ and contributing to more hazardous landfill. (e) Composite roofing is less prone to damage from hail storms or workers accessing the roof. (f) Snow loads are less apt to slide off than other roofing products, which can destroy gutters, cars, landscaping, or other property, and people. Snow loads can present a grave risk to people or animals trapped under it's fall. They have snow guards, but they are more problematic than they help. Snow guards attached mean there will be more holes punctured through your roofing, they trap debris on the roof, which causes more moss, they are unsightly, and pose a hazard for workers needing to access your roof for servicing. 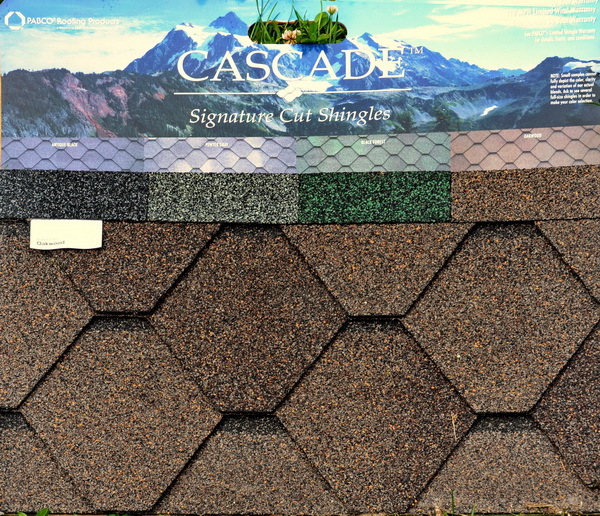 Pabco makes an attractive shingle pattern called Cascade in a thick 50 year composite shingle. It is cut in sort of a diamond pattern, but most importantly this cut leaves less traps for small debris to be caught in, which contribute to moss growth. Close by tall tree shade and fallout causes most of the moss growth issue here in the Great Northwest. I do not hold much stock in roofing warranties, but the better life roofing tends to be thicker, so it is more resistant to high wind damage. (a) Far Too Expensive: cost way too much for the short time span they actually last. (b) Poor Installation: Due to the irregularity of the material, it is very sloppily installed, leaving many errors that will allow water under this exterior layer and cause leak, let alone in a high wind situations. Faulty new shakes are often not discarded. (c) Serious Moss Problems: They grow mildew and moss worse than most any other roofing, making them terribly dangerous to access the roof for any cleaning or maintenance, so the workers have to wear special shoes with steel spikes on the bottom (no joke), which will tear up your wood roof and leave unsightly irregular pock marks on the shakes from their foot prints. (d) Flashing Problems: It is very rare that they flash it right, let alone use rust free sheet metal. The flashing they use in over 90% of the roofing projects is cheap painted steel, which will rust through within a couple decades, so the 40 year warranty for the shakes is completely irrelevant. (e) High Maintenance: costing around $1k to $2k a year to properly clean and treated with chemicals and fire retardant to keep it under warranty, so most Home-owners don't bother to have it treated, since the cost out weighs the cost of re-roofing in half the time, so the shakes are typically lasting only 20 years at best. Many shakes will need replace well before whole roofing is needed, yet near impossible to replace individual shakes that are damaged, and impossible to replace them with hidden fasteners. (f) Poor Ridge Cap Design: roof ridge and hips are only stapled together with these irregular pieces. They are connected with exposed steel staples and are not done well at that. They are prone to rust and fall apart. Even in the best situations, they do not seal the roof along these top edges. A ridge cap metal would be far better, but can look odd. (g) Fire Hazard: This type of roofing can be treated with a chemical fire retardant, but there again it is very expensive to have it retreated to maintain it's resistance to even small cinders lighting on the roof, so it remains one of the most flammable roofs known. (h) Fragile: prone to these shakes crack apart at the supporting nail or staple. Will be greatly damaged underfoot from workers wearing cleated shoes, and then not being informed which shakes need replaced when they're done. Broken-off branches hitting the roof. Just normal weather damage with whole pieces becoming dislodged from the roof. They also have been known to be completely decimated by hail storms, resulting in a full replacement. I happen sit on a jury case involving a huge law suit regarding damaged cedar roofing in Kansas and Texas from a freak hail storm back in 1996, so don't think it cannot happen where you live. (i) Hard to Repair: When some shakes need replaced they are not flexible like an asphalt shingle, so it is near impossible to extract and replace with a hidden fastener. The better solution is to have some thin sheet metal shoved under the broken or decayed shake, but that could make for a slip hazzard. (j) Frustrating: you will become very frustrated by the frequent gutter failure this roofing causes; with the chunks of moss and wood breaking off caught in your gutters. Then those chunks float over to the outlet and plug up your gutters quite often. (k) They're Down Right Ugly! Some people think it looks charming, and whole neighborhoods require this type of roofing, but I think if we try to see it for what it is we will see how it actually looks terrible! (The Emperor is really naked, isn't he?) You have smooth planed boards painted for your siding or some imitation of wood siding, so why then would you consider having a rough split wood shake roof that makes your house look like an old shack or barn? Charming? Really? That makes no sense. If you think about it logically it's like a beautiful woman in an evening gown wearing an old tattered straw hat. If that was not bad enough; it then turns an ugly gray from the Sun's bleaching UV rays within just a few years, unless you pay thousands of $ to have the roof treated frequently, which rarely winds up happening, since 20 years of that and you would have paid enough to buy a new roof or 2. If you fully understood the many disadvantages I've experience accessing these roofs you would also see them as the most hideous option one could consider. It is time that will tell if this will be a good alternative for roofing, but several Roofers are electing to cover roofs with a rubberized plastic cover stretched over like a big tarp and held in place only around the outer edges to minimize pentrations. They look nice and clean when first installed. Usually in a bright white to help deflect heat from the Sun, which looks really odd on most houses, so this is used a more for flat roof that are not seen much from the street view. I am very skeptical for several reasons, but have not personally seen failures, so I cannot confirm whether this to be a good or bad choice as a roof cover. I am sure their Salesman make amazing claims about the long life-span these will have, but I imagine their true motivations are saving them a good deal in labor to install this simplistic roof cover. I know they also use a painted steel edge metal this cover is bonded to all around the parameter, and around the roof penetrations, so that does not bode well for their honor and integrity. (a) It is the use of steel sheet metal I have a huge problem with. 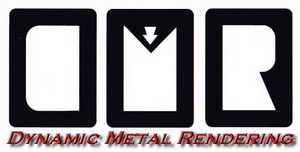 A simple magnet test can reveal what type of metal they are using, so they cannot hid this fact. Only steel will attract a magnet from it's iron content. You must be there to inspect it before it goes on your roof, and insist they do not use any steel parts. Including the nails or screws. You cannot trust what their Sale Rep says. You may even have to order the aluminum flashing yourself from a local sheet metal shop for this Roofer to use, and make sure they use it. They may end up substitute steel flashing, and scrap your aluminum for a profit. (b) It remains to be seen just how long the membrane actually last under the UV rays of the Sun. (c) I am also concerned about the membrane chaffing from underneath as it moves against the roof surface it is covering, which is going to be considerable. (d) I am also concerned about wind damage and punctures from a fallen branch. This whole membrane would then have to be replaced. Not just a small section. Perhaps they can patch it like an air mattress, but how long will that patch hold up? 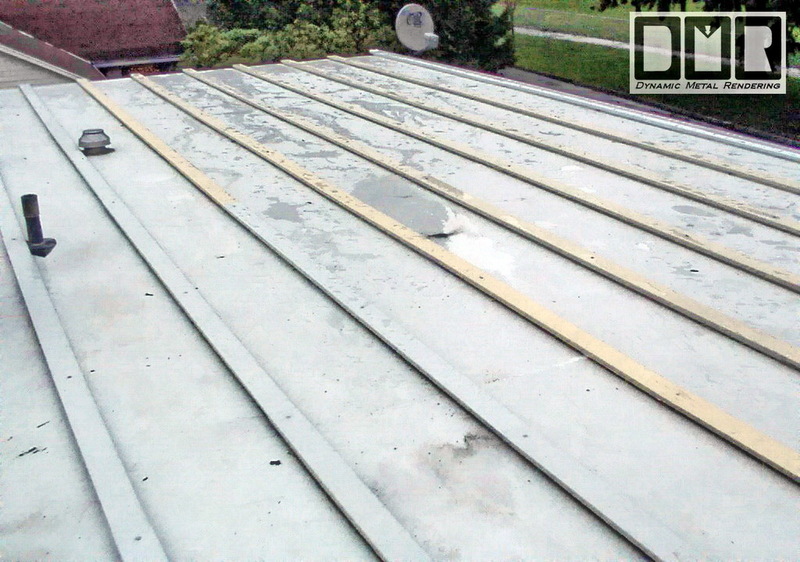 (e) Many roof covers are prone to damage from hail storms and workers accessing the roof. This seems all nice and pliable when it is new, but will it become brittle within a decade, like most plastics exposed to direct Sunlight? (f) Snow loads are more apt to slide off than other roofing products, which can destroy gutters, cars, landscaping, or other property, and people. Snow loads can present a grave risk to people or animals trapped under it's fall. They have snow guards, but they cannot be used on this type of roof cover. Snow guards attached mean there will be more holes punctured through the membrane. They trap debris on the roof, which causes more moss, they are unsightly, and pose a hazard for workers needing to access your roof for servicing. Another product used for roofing is recycled rubber molded to look like tile or wood shakes. We are already seeing this fail in short order, so avoid being sold on this product. It may seem 'green' to use recycled tires, but not on a roof with such Sun light exposure, unless you're prepared to replace it each decade. Many Homeowners are being fooled into paying extra money for a steel metal roof cover due to their unrealistic claim; suggesting they have a 50 year paint finish and shed debris far better than any other type of roofing, yet they really will not last more than 2 decades, regardless what their Sale Rep emphatic claim. You'll want to replace it far sooner than 2 decades though, because of the many disadvantages listed below. Remember; you can tell if a Salesman is lying by seeing his lips move. Beside the hundreds of metal roofs I've been on; we lived under a metal roof for a 4 years in Lake Oswego (2003-07) and it was already beginning to rust after less than a decade. I had to fix a few leaks over the kitchen, so I would know how there's not much good to say about a metal roof, other than it is the only type of roofing that can be recycled when it needs replaced. Not that you would benefit from that directly in most cases. Many Roofers would be quick to disagree with my opinion of metal roofs, but if you read through this carefully I cannot see how anyone could truly debate these issues. Even if it were made with real solid copper a metal is not a good roof cover. Cheap steel accounts for over 90% of what's used for metal roofs, so the main issue should be quite clear: it will rust and look quite ugly before long forming holes and your roof which will leak, and most do not have a high temp underlayment as recommended, because of the added cost. (a) Aesthetics: other than copper, a shiny painted metal roof may look nice and modern on businesses structures that wants to draw attention, but they look absolutely atrocious on most any residential house. Far from casual or inconspicuous looking. They are great if you happen to suffer from a lack of attention disorder, but in that case I would highly recommend therapy that should be more helpful in the long term. (b) Noisy, Noisy, Noisy! : be it from the Sun coming out between the clouds, causing sudden expansion or contraction that is different than the wood structure underneath, making them pop and creak. Rain: perhaps the 3x amplified sound of the rain or Critters scampering across may seem charming at times, but when it comes to Hail; you will not be able to hear the TV at a normal volume or speak to each other without shouting. There is also the occasional Tree Branch, Acorns, and Pine Cones that fall; hitting the roof, which can be down right scary and often so loud it will jar you out of a deep sleep. 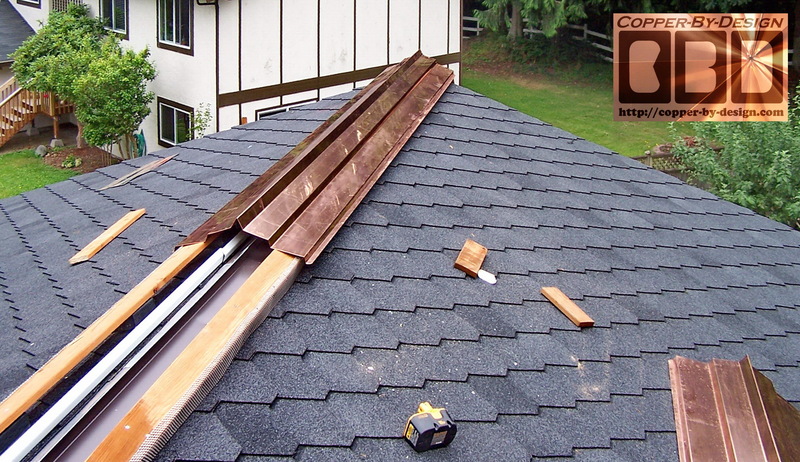 (c) Rain and Snow: rain will shoot so fast down the roof panels that it will often over shoot the gutters. Especially at the valleys. But more importantly thick icy snow loads will slide off even on low slope metal roofs and often cause a great deal of damage to the gutters and other valuables like cars, property, landscaping, animals, and people. See our Sheet Metal Roofs & Snow Page for more details and photos. (d) Rust: I have seen in this area of the country that not only most metal roofing are made of cheap pre-painted steel in order to compete with other roofing products, but it accounts for well over 90%, since most people are not aware of the dramatic difference in sheet metals like aluminum or copper. The manufacturers are making unrealistic claims of a 50 year pain finish, which is simply not holding up more than a decade or so. It is a fact that cars have a far better paint finish. Even when you have your car waxed on a regular basis you still need to have it re-painted within a couple decades? Are you going to pay someone to clean and wax your roof every 6 months? Of course not! How much would that cost? To strip the worn paint down, prime, and a new coat of paint would cost more than a full replacement with new tile roofing. I have witnessed lots of evidence of metal roofs beginning to rust in less than a decades and be nearly paint free within 3 decades. Of course covered with rust and suffering many holes through that thin steel sheet metal. Once rust begins to form it is too late to just have it re-painted. The paint may stick to the rust, but the rust would just flake off the remaining steel. It would have to be carefully sanded down, which is very costly, and would cause a penetration of the thin sheet metal. The roll forming machines that make these roof panels are known to crack the paint before this roofing panels are even installed on the roof. This allows for the beginning a cancerous rust to form right from day one. They also get scratched up from the installers and other workers who will need to service the roof from time to time, like cleaning your gutters. It is a stress you are not going to enjoy worrying about the paint getting scratched up. 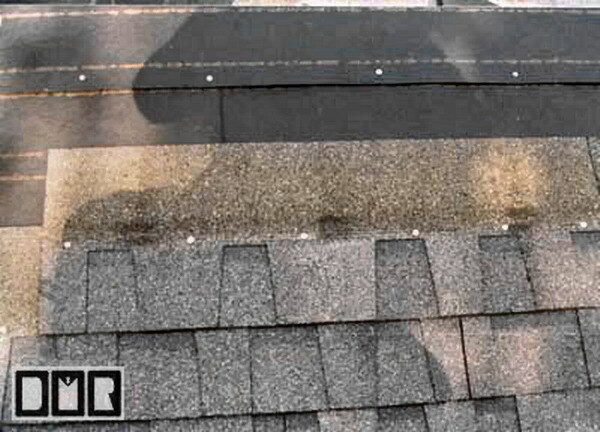 (e) Function: roofers do not seem to know how to flash and seal a roof properly, and will not even take the time to bend a drip edge along the bottom edge, causing the rain water to trickle back under the roof, dribbling behind the gutters causing dry-rot, or shooting over the gutter in a heavy down pour. (f) Stability: metal roofs have been commonly known to not be fastened down well enough, and have ripped right off houses in high winds. Which has caused a lot of damage and death from these flying blades of metal, besides the damage inside your house you'll suffer before it can be repaired. (g) Leaks: these need an expensive high temp Water & Ice Shield underlayment put on before any metal goes on your roof, yet this is rarely done. They are very hard to flash properly around the many obstacles found on most any roof, and high winds will easily blow rain water up in these areas causing damage inside your house. Especially around chimneys, sky-lights, roof-vents, pipe-vents, and dormers. They will trap a lot of debris on the roof above and around these obstacles and especially in the valleys, which will decompose and hold moisture against this metal and accelerate the rust issue listed above. (h) Dangerous: they are very dangerous to access for servicing, since they mildew in short order and become very slick when even lightly damp from morning dew. They become slick like a water slide. Wood shakes also moss-up like this and become very slick, but at least we can wear special cleated boots. There are no special shoes to make metal roofs safe without scratching up the paint surface. (i) Expensive: even if they did last as long as they claim, they are still over priced. Clearly with all the disadvantages of metal roofs listed above they are not only a very bad choice even if they were half the cost, so they are a huge rip-off at what they normally cost! These can look very snappy on a house, but there is a huge difference of lasting quality between these different materials. Clay and slate will last a good long while if done right with rust free flashing. Although, there's the main issue that prevents these from lasting 1/3 as long as the Salesman's claim, since most Roofers will still use cheap painted steel flashing and vents, so this type of roofing will only last a couple decades even if it was flashed correctly. Remember; you can tell if a Salesman is lying by seeing his lips move, so even if he says this will have rust free flashing you will still need to be on-site to test the flashing with a magnet before it goes up on your roof, and then insist they take it back to get aluminum or copper flashing in stead. No matter what delays this would cause you'll need to stand your ground, or you've lost 2/3 the value of this roofing contract and life span of your roof. Besides all the stress you'll suffer down the road. (a) Very Expensive: tile roofs may look great, but they are very expensive, and rarely found with real stone slate like you would see more in Europe. (b) Poor Flashing: It is clear flashing is the #1 cause of roof failure, but even though you paid through the nose for a tile roof; in most cases they are still not flashed any better than any other cheaper types of roofing, so it fails just as soon (no joke). These 80 year roofs are only lasting a couple decades. You will not likely know where the leak is coming from, so another roofing contractor will tell you the whole roof needs replaced only because he wants to sell you over 10 times the cost of what the roof actually needs to repair it. (c) Not Installed Right: finding good craftsman to properly install a tile roof is rare, let alone a slate roof. Later service is then just as hard to find, if not harder, since Roofers do not want to be bothered with small repair projects that are not as profitable. (d) Fragile: most any roof tile are fragile. Some more than others. Making it very costly and stressful to have any service or cleaning done. The concrete and concrete composite tiles are very fragile, no matter what lies the sales-person may claim. The composite tiles are also prone to more damage from exposure to the elements. Metal tiles are hollow and impossible to walk on, so this will be a huge problem down the road. Those with plastic in them will degrade significantly within a decade. Fallen tree branches can be very destructive, and the leaks will cause a good deal of costly internal damage before you may realize what happened. (e) Not Water Tight in high winds: Clay is actually rather porous, unless they are made with a kilned glazing (like dish ware), but is rare to find and much more costly. Also, most tile are designed to be rather loose fitting and do not overlap each other very much, so strong winds can blow rain water up under the tiles and caused water damage. For this reason an expensive Water & Ice Shield underlayment is needed, yet rarely done, since it is more expensive than a standard roof shingle. (f) Weight: They are very heavy, and could cause structural damage to the roof structure if not framed well enough. Especially under a thick snow load. (g) Moss: They grow moss and mildew more than composite roofing, clogging up the gutter each year and damaging the tiles. Soon becoming very unsightly, but some may find this rustic look quite charming. For this reason they should sell tiles with fake moss already on them in somewhat random patterns. Again it is time that will tell if this will be a good alternative for roofing, but so far I have not seen a good version of this. Snow Roof was one of the early versions of a product that comes in big buckets and slathered on as a temporary patch at best. Their Salesmen will make the most fantastic claims, but this cannot possibly flex well enough along with the expansion and contraction all roof structures are subject to, and maintain 100% seal at every crevise. (a) Steel sheet metal flashing is still a huge problem with any roofing. When water does get under this cover, which it will, it then traps this moisture that is not allowed to dry off as fast, so the metal flashing is exposed to that moisture a good 100X more than normal and rusts out the steel that much faster. (b) It remains to be seen just how long the plastic actually last under the UV rays of the Sun, but from what I've seen it rarely last more than 5 years before you see a lot of cracking and the edges pealing up and off the roof surface, which looks horrible, and is of course not able to do it's job, trapping debris more than ever. (c) Many roof covers are prone to damage from hail storms and workers accessing the roof. This seems all nice and pliable when it is new, but that plyability will not last long. (d) Snow loads are more apt to slide off than other roofing products, which can destroy gutters, cars, landscaping, or other property, and people. Snow loads can present a grave risk to people or animals trapped under it's fall. They make snow guards, but snow guards attached mean there will be more holes punctured through that roofing product. Snow guards trap debris on the roof, which causes more moss, they are unsightly, and pose a hazard for workers needing to access your roof for servicing. They seem quite charming, but tend to get infested with critters and other contaminants. There is nothing else much to say on this subject, since you would be hard pressed to find a thatch roofing craftsman here in the States. Beside the fact that your neighbors may have issue with it. First off, most Contractors do not carry the proper liability insurance required for doing roofing work or the workman's comp that covers their workers for being up on a roof. This liability insurance is about 5 times as expensive as any other type of construction liability insurance. This has nothing to do with the dangerous nature of roofing. That is what Workman's Comprehensive Insurance is for, so if a worker falls off and gets hurt they will not have to sue the Homeowner. As long as they do have the proper Insurance to protect them. Their liability insurance is to protect you incase the Roofing Contractor or his workers screw up the roofing project and damage your house or property. It seems that the Roofers in this area have been doing such crappy work that they have accounted for 70 to 90% of all the claims processed by the CCB for Oregon and driven up the cost of this type of insurance. This is one of the worst statistics you are likely to run across in any field. And that is even considering how most Homeowner are not able to act on their complaint within the first year of completion, so it becomes a moot point, as their claim is invalid, since the CCB only requires a 1 year warranty by all licensed contractors. Few Homeowners will check into a Roofing Contractor's background for reported complaints, and to verify they carry the proper insurance that covers roofing work. Take this time, or you will be sorry I can assure you. Demand a detailed written warranty from that Contractor, which is much more than just the one year they are required to offer. Not just the roofing material warranty from the manufacturer. Make sure they will warranty the flashing to last as long as the roofing warranty, since the flashing comes with no warranty. There should be no reason a reputable Roofer would not be proud to write you a 25 year leak-free warranty if they truly believe in their work. OSHA is the department that makes up the standards for safety requirement: Occupational Safety Hazard Administration. They say a worker needs to be tied off to a safety anchor that connects to his safety harness if they are working more than 10' off the ground. OSHA approved equipment of coarse. This equipment is expensive, needs replaced if it is ever exposed to the stress of a fall, limits the worker's mobility, which of coarse impairs their productivity. So you are not too likely to see Roofers wearing these harnesses. I always wonder how the worker is suppose to get up to the peak of the roof safely to even hook themselves to this anchor that is not even there in most cases? Let alone go up there with tools to install this anchor point. They do not have a lot of Inspectors and do not have a system to know where these work sites will be and when, so it is rare to see a Safety Inspector at your job site. In my 15 years up on roofs on a regular basis, I have yet to see one Inspector at any of my job sites, so you'll be the only one to safe guard your work site. As stated above, if your Contractor does not have the proper Workman's Comp insurance on their employees, which is about twice the cost, if a worker injures themselves their only recourse is to sue you the Homeowner. No joke! The proper Workman's Comp is so expensive that it is probably more common than not those workers are not covered. 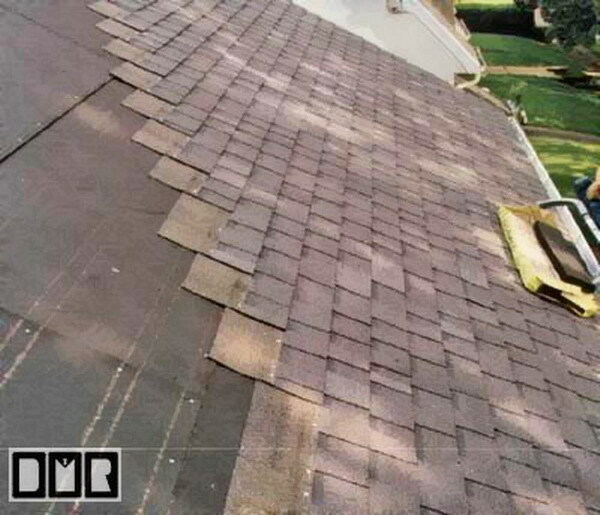 This is one detail you will need to check out before hiring a Contractor to do your roof. Don't just take their word for it. Most people don't bother or know how to do these sort of background checks. You can insist on getting their insurance carrier's contact info and their policy numbers. It's as simple as that. Remember; there are two different types of insurance they must carry by law to do business. If they give you any flack about this issue, you will know not to hire them. 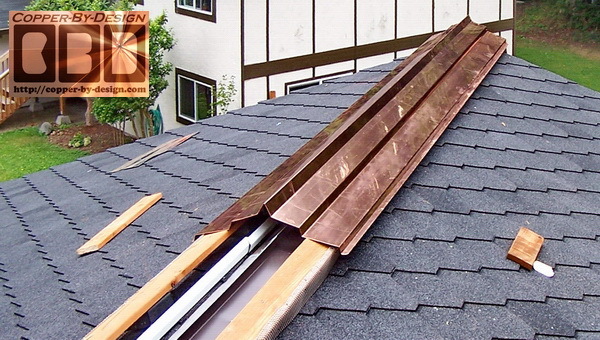 If there are already two layers of old roofing, insist that your old roof be removed before a new one is installed. Three-layer roofs might not comply with FHA mortgage inspection practices and if you are considering selling your home anytime soon, you may have difficulty closing or worse, be asked to tear your new roof off and re-roof it after removing the old roof layers. A full tear off is the only good way to get a reliable roof job. Most people think it is just to get a nice flat laying roofing material, but that's only one advantage. Most Contractors will use short nails or staple to minimize their costs. When there is several layers of roofing left on the roof, it will not allow for those short nails to have a good grip into the wood deck of your roof, and may cause the roofing to be more prone to wind damage or even dislocate and slide down opening your roof to leaks. Also, it adds a great deal of weight to your roof structure, and there is only so much weight the roof structure can handle. It may not seem like a lot, but I have torn off 12,000# a single dwelling house. Adding another 6,000lb to it with the new roofing being applied, that makes it 18,000lb total. Was your roof built strong enough to use it as a parking lot? It better have if you are going to put that much weight on it, yet your roof is 1/3 the strength of the floor in your house. Some older houses I have seen have 32" spaces between the roof trusses, instead of the modern code of 24" apart. And if that were not bad enough, they had no cross bracing inside, or had it removed for better attic storage space. I could see the roof sag from the weight of just a single layer of roofing, and felt like I was walking on a soft springy surface when up on their roof. a bad snow storm could cave in their roof and cause the whole 3 story house to collapse. This photo shows a three-layer tear off down to the skip sheeting boards I did back in 1996. It also shows the tarps I bought new for each job. Instead of just using the cheap black plastic rolls most Contractors use. You should make sure they cover the roof each night; rain or shine. As you know, the weather can change on a dime here in the Great North-West. The weather can completely change in an hour or less regardless what the Weatherman said. It also demonstrates the care I went through to protect their home and property. I built this shoot over the back balcony to divert the debris off to the side. Also, I would only use exterior grade plywood that was over the minimum code thickness. Most roofers will use the cheap OSB chipboard. Even though it is allowed by code, you should remember that the house will sweat, and this moisture can break down the glue, and you would have a mess to deal with that you really are not going to like! Also check to see where they are taking the old roofing they removed and ask to see their receipts. Plenty of Contractors will not want to pay the $75 a ton the dump fee. That is how a lot of the illegal dumping winds up happening. 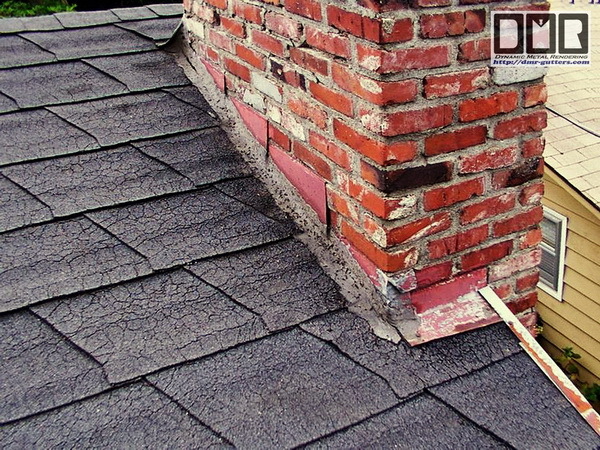 As I have clearly stated above; roof flashing it the #1 cause of roof failure by design, and chimney flashing is the worst problem you'll have to face getting them to flash it properly and not damage your chimney in the process. Still to this day well over 90% of the roof jobs I have seen are done with just cheap painted steel flashing, if redone at all. Even if the flashing is not rusty, an inspector would not want to see the old steel flashing reused, since it could not be expected to last the life of the new roofing. One of the main factors of this issue being such a problem is how the Roofing Suppliers are out to discourage if not ban the use of rust free flashing to avoid warranty issues of the shingles they sell; because they need the flashing to fail first. This way there is no liability on their part, given the flashing they sell has no warranty, since most Homeowners do not ask about the flashing used. This is their 'catch 22' to assure you have no recourse for a premature roofing failure. I have witnessed Contractors telling the homeowner they are going to use stainless steel flashing and valley metal under the new tile roof, yet when I arrived to remove the gutters they had already installed cheap painted steel flashing for under that very expensive 80 year tile roof they were installing. There is no need to paint stainless steel sheet metal, so that was a clue. Also; the stainless steel sheet metal will not attract a magnet. Only steel will attract a magnet with it's iron content. There are dozens of other metals that have no iron in them. Good stainless steel has no iron in it and will not rust like most of your utensils will. They were paying a huge amount of money to get this expensive 80 year tile roof, yet they were going to suffer leaks within 15 to 20 years with no warranty to fall back on, since it was not the tiles that failed. Not knowing where the leaks are coming from another Roofing Contractor will lie to them and say: 'The roof was badly installed, and they have to replace the whole roof. Only because Roofing Contractors will not bid on low $ jobs to just replace rusty flashing. Believe it or not the photo on the left show the flashing nightmare that was deemed acceptable by their Roofing Contracor, and was causing rust stains on the new roof emediately afterwards, as you can clearly see. This type of unfinished work has been the standard for the last several decades. The light colored side step-flashing was the only new pieces added and still just cheap painted steel. Copper is your best value long term and even short term considering all the cost or effort to reflash a small chimney like this. Aluminum flashing can be custom made to order, but very few sheet metal shops understnad the concept of chimney flashing and are rarely willing to work up such a small order. Many Roofers do not even realize that aluminum flashing is an option for them, since the painted steel is all they see available at the professional Roofing Suppliers. To reflash a single flue chimney like this typically costs you $800 or more. Out of that cost they would have saved only about $25 doing this with cheap painted steel, compared to a thicker aluminum metal. Clearly you can see how a good 95% of this cost is labor and their business expenses, so why use such a cheap metal that they know will not last, when it would effect your cost by less than 5%? Also see our 'Chimney Flashing' web page to see more details of the most highly neglected area of roofing. 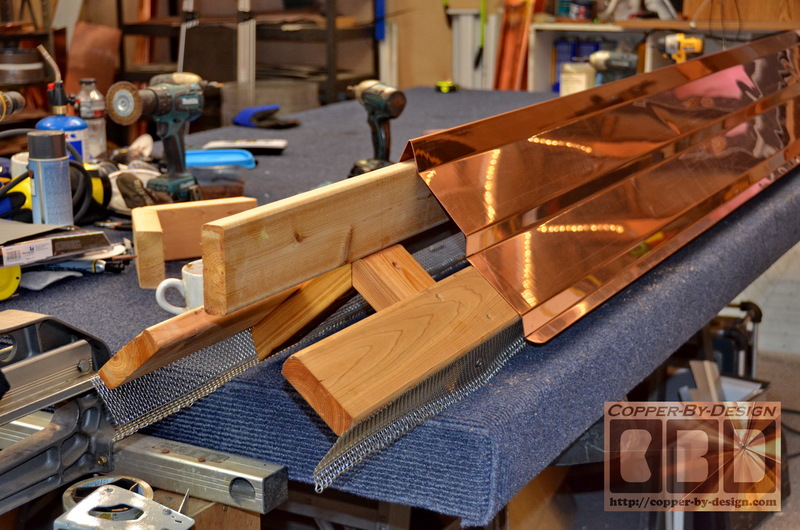 I make lots of custom copper flashing kits for clients across the Country, so feel free to inquire about a custom kit for your chimney. I seem to be the only one in the Country offering this service. Also, if you have any dormers, or walls that protrude from the roofing; these are areas that are rarely flashed in a re-roofing project, but should be. 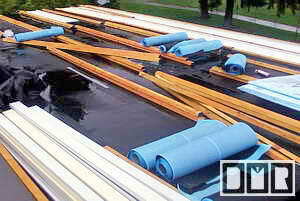 Although, it may be very challenging to get your Roofer to be willing to install these better parts. Back before there was plywood and asphalt shingles cedar wood shakes were commonly used to cover roofs here in the Northwest. They went over board that were spaced a few inches apart and went on so loose venting was not an issue. These days with plywood and modern roofing materials used the roof has to have proper ventilation figured out and implemented to control damage from condensation and excessive heat build up inside the attic space. An air intake also needs to be properly implemented as well, but is often overlooked. I was not impressed with the parts sold for these purposes. The ugly pod vents are not made with a rust free metal, and the plastic vents are even worse for longevity. Hidden ridge vents are better, but again I was very disappointed with what is sold to professional Roofers, so I designed a sturdy wood frame system with a stronger stainless steel screen that will resist critters clawing or chewing through to nest in your attic space. Copper for a ridge cover are expensive of course, but it has anti-fungal properties that can help minimize the moss growth, which would save you $ down the road. 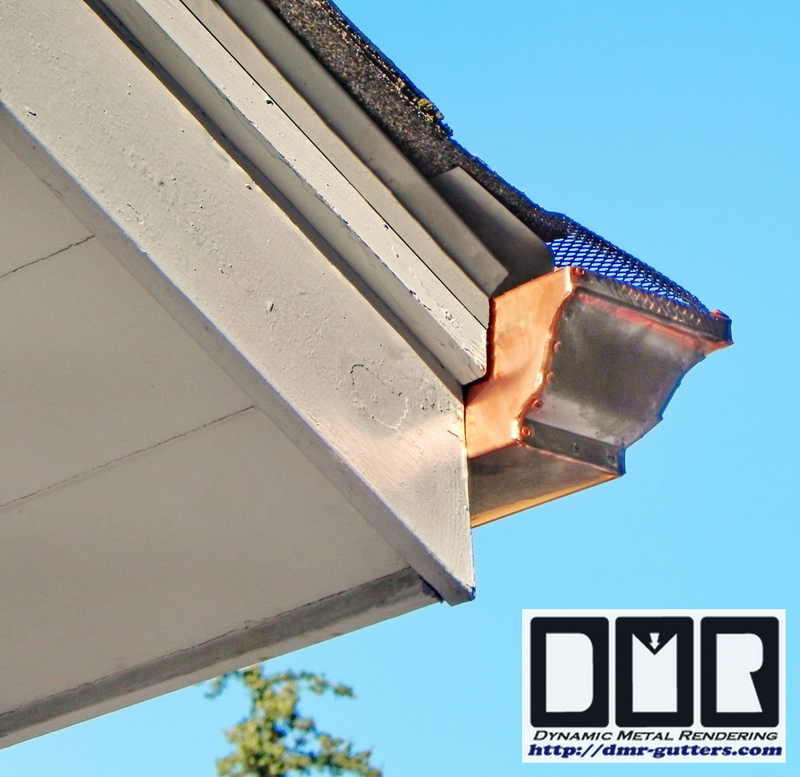 This solution may be your only option if you have copper gutters. Mounted with the high grade stainless steel screws I provide they can be gently removed when reroofing is needed, so they should be just a one time purchase, and possibly increase the resale value of your home more than the cost difference. This may not be the easiest and cheapest solution, but if the others do not work right or last what's the point? It is interesting to see how these days we will easily spend $30k to $45k on a car, yet not be willing to spend an extra $5k to $10k on a much better roof system. You have to wonder why that seems so much harder to do than spending so much more on a new car with a few added accessories, which would not really make any difference to the car's performance or longevity? Contractors will use a cheaper OSB sheeting if you don't insist they use exterior grade plywood. This is an important detail, as you roof deck is only half as thick as your floors and the underlying riif frame has a wider span by 8" than your floor, so it is at best ont 1/3 the strength. You need to imagine several feet of snow on your roof as well, like we had here in 2008. Plywood has alternating wood grain for each layer, which will hug the roofing nails tighter. The CDX plywood is also made with the exterior grade glue, so it will not fall apart if it gets wet. I've seen many houses being built that had been rained on several times before the roofing felt went over it, so that OSB got drenched and it's strength was compromised, which means it also will not be holding the roof trusses in place nearly as well during an Earth Quake. Sloped roofs only require 1/2" plywood as a minimum thickness to span the 24" wide rafter joists placements, compared to a floor that has 16" centers and is at least twice as thick. That means your roof is only 1/3 as strong as the floor in your house at best and will feel soft like a trampoline between these joists. There's only 3 supports under a 4' wide sheet of plywood, and 2 of those are only held by a few nails along the very edge of that sheet that covers just half of that 1.5" wide truss. With 3 layers of roofing and over a foot of snow that could be over 1,000# on top of each sheet of plywood. You might as well have small cars parked side by side covering your roof, which is a lot more than a refrigerator. The minimum building code does not mean that is what they are suppose to use. It is just the least they can get away with legally. Since they do not sell 1/2" plywood it has to be a little thinner, or a little thicker. What do you think most Contractors will buy? The thinner plywood of course, so it is not actually up to that minimum Building Code. My strong advice is to have them cover the whole roof with an additional layer of 3/8" plywood with alternating seams for a reasonably decent roof cover before the new shingles go on. They could even do this over a single layer of roofing shingles, but then the 3 maximum layer rule might be exceeded if they do not realize there is a layer of shingles hidden under that plywood. For flat roofs they are suppose to use 3/4" plywood or thicker, but I've seen many cases where they did not bother to meet that minimum requirement as well. You should insist they use more than the minimum required thickness, if not the multi-layer I recommend with alternating seams, or you're just wasting the cost of their very expensive labor and business expenses, which is a good 2/3 of the cost for most any construction work, and even higher for roofing work. Personally I'd like to see them attach that plywood with deck screws the way I do without even being asked, but I know that's asking way too much of them. Try asking for deck screw attachment and see the reaction you'll get. They'll look at you like you've lost your mind, if not say this to your face. They will try to convince you it is completely unnecessary, and even detrimental to the structural strength. But if they do, what does this really say about their ture intensions? Can you trust a person like that to even walk your dog? Take a moment to ponder this concept. The underlayment is installed over the roof deck before the roof covering goes on. It is necessary as a vapor barrier, so that condensation under the roofing cover will not cause the black mold in the wood roof deck, which has plagued so much home construction and renovation shoddy work. A thin 15# saturated tar paper called roofing felt is the standard, which is use on 90% of roofing jobs for it's low cost of around $5 to cover a 100 sq' area, but it's very fragile and will tear easily under foot. Often that thin felt just tacked on with small staples, which will most often become compromised before the Roofers are finished installing it from just walking on it and wind damage, let alone by the time they're finished with the whole roofing job. It may cost twice as much for a thicker 30# felt, but roofing felt is still one of the cheapest parts of this sort of project. It will not be used if you do not have it written into the contract, and also be willing to be there to make sure they actually do use it. Also, several hardware stores sell a roofing felt labeled as 30#, but is actually as thin 15# felt, so buyer beware. It should be thick like leather, so you'll know if it is the right stuff. Behind me in this photo taken back in the late 90's you'll see the 30# double thickness roofing felt I'm standing on just above the new roofing shingles. It's purpose is just to be a vapor barrier, but it can protect the roof temporarily before all the roofing material is installed, as long as it has not been compromised. It is best not to be exposed to the Sun longer than 4 to 6 months, and will get torn off the roof in a mild wind storm if just stapled down like most Roofers will do. If you have a low slope roof or just want some extra protection there's a rubber underlayment with an adhesive to stick to your roof deck without th need for fasteners, and hug the nails driven through it to create an air-tight/water-tight seal. This can be used instead of the cheap saturated tar paper, but it adds good $40 - $70 per square (10' x 10' area) to the cost. You need to know how the more recent development of a high temperature version of this underlayment is now sold and is the only type of this that should be used, because of the high failure rate of the earlier versions. Although, few Roofers are willing to pay the extra $ for it, so you will need to force the issue with them. They will try to counter it if you bring this up, making claims the cheaper W&I is perfectly fine, but you need to stand your ground firmly. I do not understand why they even still sell the earlier versions when they know it won't last, but it is a little cheaper, so that is what most Roofers will buy, since most homeowners are non the wiser to this issue. You would do well to make a trip to your local wholesale roofing supplier to check out samples of these roofing products in order to become a more informed consumer and not fall for the scams you will be faced with. While there ask them why they will not stock any aluminum flashing parts. They may not sell you roofing products directly w/o a Contractors License, but they will happily show you samples of the different products they sell to Roofers. Again, while there ask them if they stock 0.027 thickness aluminum flashing parts, in order to help try to change this huge problem within this industry. Although it will not likely make any differnece until we illegalize the use of steel for any exterior applications. They will have sales fliers about roofing materials to take, or at least make notes of the products that you favor. Local companies named ABC Supply, Dealer's Supply, and Woodfeathers are wholesale suppliers that have a good set of sample roofing and other products on display. They cannot recommend a good Roofer to you, since it would conflict with their client base, but you can ask them which Roofing Contractor consistently buys the better roofing materials and uses only aluminum or copper flashing. That alone should be your best referral towards a decent Roofer, if one actually exists. This shows how roofing shingles have to start at the bottom and work their way to the top. It is surprisingly simple work. 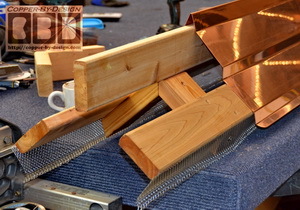 I hand nailed the roofing shingles with aluminum, copper, or stainless steel 1.5" nails. It does not go as fast as those Roofers who use a pneumatic coil nailer, or a staple gun, but these pneumatic power fasteners tend to blast the fastener right through the soft roofing material. Many of the roofing manufacturers no longer warranty their product when Roofers use a staple guns, yet most Roofers still use staples today. Only because it's cheaper and they don't have to reload as often. Even the coil nailers are too brutal to the roofing material, and many homeowners have lost roofing shingles in high winds because it. I don't place much stock in the manufacture's warranties, but I also insisted on installing the higher quality 40-year shingles. Mainly because I know it's a thicker product that is heavier and much less prone to wind damage. Most roofers will not openly tell you about the thicker product, since it's a lot heavier to haul up onto the roof and harder to cut with their utility knife. They simply do not want to mess with it. It is a matter of being just that lazy. Very few Roofers will consider hand nailing at any price. They do not make aluminum nails for the power nailers, but they do sell them in stainless steel for them. This option should only add around $200 - $300 to your cost, but it's well worth it! The shingles only over-laps the nail head by 1/2" or so. When I have torn off a roof it tells a story. I've seen how most of the nails were rusty. Again, it does not take a genius to see this evidence of what failed with the old roofing and why it now needs repaired. Pretty much all Roofers have seen this same evidence. These are some of the things I have found that are the most common causes of roof failure, and the products that can help to avoid this in the future. Most of the money you will pay is to cover the cost of labor and business expenses, so if you have to roof half as often, due to a little more cost for better materials, that is still a huge savings and less landfill of that hazardous waste! Reports show that construction debris from this sort of common work accounts for 40% of what goes to the land fills each year and has poisoned our water table. Here is a close up, showing the 6 aluminum nails I used on each shingle as recommended by the manufacturer, yet most Roofers will only use 4 fasteners and void your warranty. On a steep roof they should use 8 nails per shingle. As you can see in the photograph, the nails go through the top edge of the row of shingles below that row, so actually there are 12 nails now holding down each shingle. As opposed to their 8 thin staples. This is a 150% stronger hold than a Roofer who is not even meeting the manufacturer's requirements. A few roofers will use a pneumatic 'coil nailer', which is a little better and will not void the manufacturer's warranty, but most Roofing Contractors will not buy them for their installers to use. It is because the loads are a little more expensive, and they will have to reload a little more often. What is worse is the inherent problem with all pneumatic power nailers or staple guns; how there is a pressure setting on them, and at the proper pressure setting they will not smack the fastener down enough when it hits the 2x6 truss under the roof deck. The Roofer will not want to stop and hit that fastener down flush with their hammer when this happens, so they will set the pressure too high. This means that most of the fasteners will not be hitting that narrow board under the plywood, which is spaced 2' apart. Most of these fasteners will be shot too deep. Literally cutting through the shingle. Which makes the fasteners nearly pointless. I recommend only hiring a Roofer who will hand nail the roofing in place, but that will be very hard to find. There is no way to blast the nail head down through the shingle surface when hand nailing. The hammer head will hit the roofing material and be stopped before the damage is done. It also means the Roofer is a lot closer to the shingle surface for closer inspection of each nail placement, which means less sloppy work and fewer exposed fasteners. Stainless steel nails are even better than aluminum, since they are stronger, and can be used in coil nail guns. But good luck getting your Roofing Contractor to buy them. Even if they write into the contract that they will use only stainless steel nails if you do not inspect them they will most likely still commit fraud just to save a couple hundred $. The bottom line for them is the need for speed to make a fast buck. This was a difficult project where they wanted a skylight over their Jacuzzi tub, so it needed to be installed crosswise, in stead of just between a pair of trusses. I had to cut through 3 rafters and then support them with a sturdy cross beam tied into the rafters on each side of this hole I cut. I had to build a framework inside the bathroom to support the roof while I was working on it. 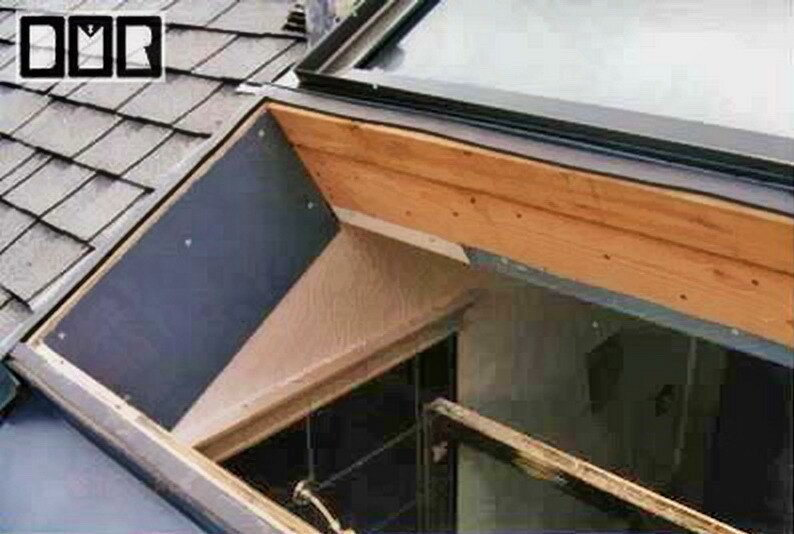 This skylight is one of the highest quality w/an aluminum frame welded in the corners. It is made with double pane glass that is tempered and laminated for high impact resistance and safety in the event of a large branch hitting it broken off in a wind storm. It is as safe as the front windshield of a car. I also had them etch the glass to deflect the light into the bathroom, in stead of having a blinding force of Sunlight sweep across the room each day, which would bleach out the floor, walls, and such. 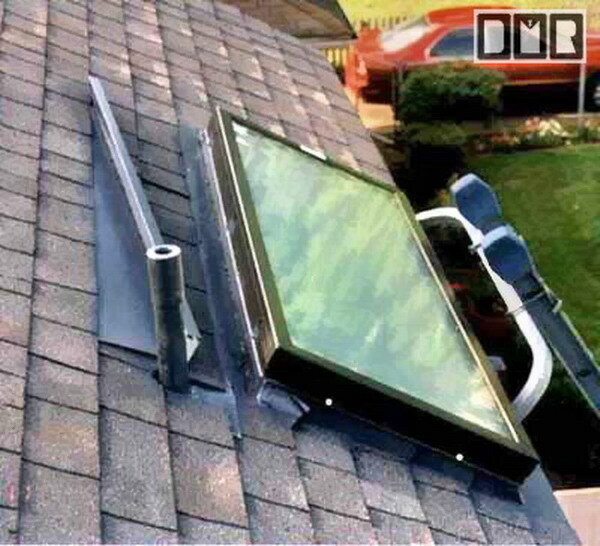 This is not common amongst skylights, as it adds to the cost, but the customer has reported they simply love it over the years. This is the skylight in place. It also shows the dark gray pre-painted aluminum sheet metal diverter that I installed to minimize the river of water in a heavy down pour that would hit the horizontal flashing on the topside of the skylight. Here is also a good example of the lead pipe flashings I used. 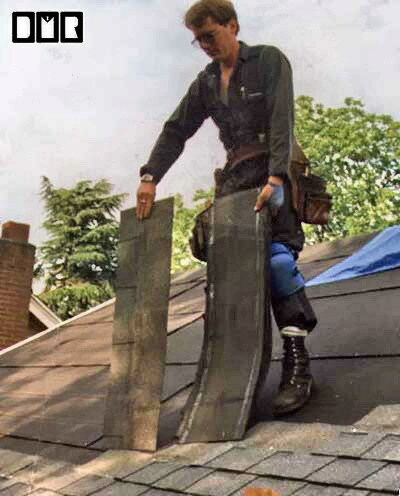 Most roofers will use cheap steel flashings with a black rubber boot that hugs the outside of the pipe. This seems like a good concept, but the rubber they use is a very cheap rubber and will deteriorate from UV Sunlight exposure within a decade, allowing the roof to leak. 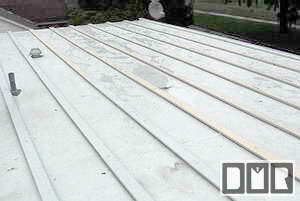 You will also see many homes that suffer from rust streaks running down the roofing under this kind of flashing. These are galvanized steel flashings, and the zinc they use for rust protection is very thin and very soft metal, which will wash off from the rain. The lead pipe vent jackets are a little more costly, but they are the only things I have seen that will last. Roof vents are also a big problem not lasting as long as the roofing. The standard roof vents these days are made of a PVC plastic. They may not be able to rust, but they are failing sooner than steel vents from UV damage. Aluminum or copper vents are the only way to last, and can even be re-used when roofed again. That is if they are not made with very thin sheet-metal to save cost. They should be at least .027 thick, or made of 20oz copper. To read our special web page on Chimney Step and Counter Flashing go to our web page for this import and issue and see how it is to be done right. Even though I no-longer am able do roofing work, if you take the time to study this information, you will be a lot better prepared to know what to ask for of your Roofing Contractor, and hopefully not get so screwed in the process. If you call the CCB, you will find that this is by far the worst area of construction trades for getting reliable work done on your house. Even more than all the other trades combined. Literally! The high 5X cost of their liability insurance is further proof of this fact you need to be aware of. As much as 2/3 of the money you pay for most construction work covers the cost of labor, business expenses, and their profit margine for the contractor, and roofing work has a wider spread between the cost of materials needed. Having to reroof half as often due to a little more cost for better materials is a huge savings in the long run and a very important factor in our ecology as well! When I have torn into any construction project it tells a story about what had failed. Why am I here is the question? It should not take a genius to see the evidence of what failed, and hopefully solve this from reoccurring in the near future. It is sad to think how pretty much all the Roofing Contractors know the solutions. Yet, you are not able get them to do the job right no matter how much you are willing to pay them. Why is this such a huge problem that there is so little ethical accountability? I even approached a few of the less terrible Roofing Contractors with a list of roofing standards, saying; if they could follow these standards, I would make it worth their while. But the response I got was that they were not willing to do this kind of quality workmanship at any price. Most were not even willing to work with the rust free parts I can supply them with. Below are some of the detailed issues and solutions to what I have found that are the most common causes of roof failure, and the products that can help to avoid this in the future for a willing roofing contractor to solve or fix those issues. If you find the information here very helpful, it would be kind of you to show your appreciation ($) for the generous advice I spent thousands of hours to provide here for the world wide web consumption. Don't feel too bad if you are not willing to appreciate us for the advice here, since only a very small percentage have been even slightly generous, even when they regularly will tip their waitress. (perhaps a sad commentary on our society and how the web is used). I would rather you get this valuable information, rather than to just tease you and force you to pay to see this actual useful information you will need. I want to see this industry change for the better due to pressure by the consumers patronizing their services. If you had bothered to read this far you are quite unique and there may be hope for you yet. (a) A full tear-off of all the layers of the old roofing shingles to be able to inspect the roof deck and replace any plywood that had been compromised; showing dark stains. Also this is the only way to be able to have them add another layer of CDX plywood over the roofing deck with alternating seams, which is a verey important detail. Especially if there's a layer of wood shakes under all that. The thickness of old roofing may not allow the short nails they commonly use to be able to grip into the roof deck below to meet minimum Building Code standards. (b) If a new roof decking is needed insist on a thicker than minimum Building Code requires. And only allow CDX exterior grade plywood. No OSB chip board should be used. Use 1" plywood for low slope roofs, 3/4" plywood for roofs over 4/12 pitch, and 9/16" plywood for over 9/12. The minimum 1/2" plywood has no longer been available for several years, so they will use just a 15/32 for this 2' wide span between your rafters. In stead of just the single layer of a thicker plywood it is even better if they will attach 2 layers with alternating seams in both directions. Attaching them with coated deck screws is best, but you will be hard pressed to get them to do this at any cost. (c) Actual 30# roofing felt minimum, or better yet a high temp Water and Ice Shield under-layment for lower slope roofs and valleys. The underlayment should be thick like leather. Not thin like paper, which will tear under foot before the shingles go on. (d) Only a 0.027 or thicker aluminum, high grade non-magnetic stainless steel, or copper roof vents and flashing used (no steel or plastic), Lead pipe vent sleeve flashing w/matching lead caps are good to use for those areas, but critters have been known to chew through lead and it is bad for you and the environment. You will need to be there on-site to inspect with a magnet before these flashing parts go on your roof. Only steel will attract a magnet. If you find any parts that attract a magnet insist they take it back and get the right parts. This is the single most important detail you need to be very insistant on. (e) Demand all the chimney and dormer flashing be replaced. Clearly written in the contract and inspected to verify it was properly flashed (or they won't do it!) See: http://copper-by-design.com/cc/cf.htm for details. Let them know you will have a third party inspect their work and it will need to be redone if it does not comply with these details, or they will be require dto pay someone else to do it right if they are not able before the contract has been fulfilled and they are paid the final installment. (f) Better than just a standard 25-year roofing material are thicker shingles for better wind resistance, so they are still a good value, even if their warranty is effectively useless. Avoid any products that claim a life-time warranty, since they are not relyable: because they had carefully worded the fine print to exclude them of any real liability. (g) Hand nailed with aluminum or stainless steel nails that are at least 1.5" long (if you can find someone who is willing to do this). Or at least a coil nail gun with 1.5" long stainless steel nails. Do not let them talk you out of this detail. They will try their damdest. (h) More nails per shingle than the minimum Building Code requirement: at least 6 per shingle on low slope roofs, and 8 per shingle on roofs 10/12 pitch or above. (i) Demand a detailed written warranty from the Roofing Contractor (not the GC or Builder), which is much more than just the minimum one year they are required to offer by the CCB. Make sure it's not just the roofing material warranty from the manufacturer. Make sure they will warranty the flashing in writing to last as long as the roofing warranty, since flashing does not come with a warranty. There should be no reason a reputable Roofer would not be proud to write you a 25 year or longer leak-free warranty if they truly believe in their work. If they try to talk you out of some of these specifications that is very telling of the corners they will attempt to cut beyond what you had agreed on, so you would do well not to hire them. I would love to be able to help you all for free, but in the real world this is simply not possible, or I would be on the phone 24/7, and you would still have trouble getting your call in to me. I am still an active Gutter Installer, using the daylight hours to get my paying work done, be it in the shop or out at a work site. Not to mention having to do local bids in the evening or paper work. That is not counting having a life outside of work. When I am up on a roof, that may not be a good time to chat for a half an hour about your problems caused by some other contractor 3,000 miles away, so we may need to make an appointment to talk when it is safer for me. Before calling us for consultation services; I would like you go to our contact info web page and send us an informational e-mail first; going over your situation, digital photos, and your contact information with times best to be reached, and I will send you a response e-mail within 24 hours to make arrangements for cost and to set up a time to go over your issues. Please follow these guide lines, or I will not be able to help you out.